Coroner: "It's almost an assured thing. 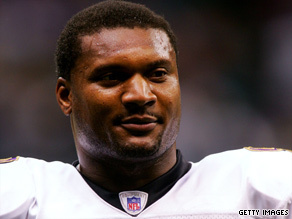 We have to be convinced otherwise"
(CNN) -- The girlfriend of former NFL star Steve McNair first shot him in his right temple, then fired three more shots at close range, most likely as he slept, police said Wednesday. She then sat on the couch next to his body, and killed herself so that she would fall into his lap, they said. "The totality of the evidence clearly points to a murder-suicide," Nashville, Tennessee, Police Chief Ronal Serpas told reporters at an afternoon news conference. McNair, 36, and Sahel Kazemi, 20, were found fatally shot in a condominium in downtown Nashville on Saturday afternoon, authorities said. "Kazemi then positioned herself next to McNair on the sofa and shot herself once in the right temple and expired. ... We do believe she tried to stage that when she killed herself, she would fall in his lap." A trace of gunshot residue was found on her left hand, he said. Kazemi used a 9 mm handgun, Serpas said. McNair was married and had four children. Serpas said he had spoken with McNair's wife Wednesday to update her on the investigation. The police chief said Kazemi had become rattled over the last week, believing that McNair was involved with another woman. "She had become very distraught and on two occasions told friends and associates that her life was all messed up and that she was going to end it all," Serpas said. He said Kazemi had seen another person leave the condo a few days before and was concerned "whether or not her relationship was unraveling with Mr. McNair." "There was evidence that she was spinning out of control," Serpas said. He added that there was no evidence found at the condo indicating anyone else was there at the time of the deaths, which is believed to be after 1 a.m. Saturday. Dr. Feng Li, the assistant medical examiner who has been handling the case, told CNN earlier Wednesday that all evidence was "indicating that she killed Mr. McNair and killed herself." The coroner said he will not finalize the "manner of death" on Kazemi's death certificate until he has final lab test results, which are a few days away. "I have to have everything together, and then I make the opinion," he said. "We want to be as thorough and as detailed as possible." Li said Kazemi was found face-down in the condo with the gun underneath her. The autopsy indicates she shot herself once through her right temple. "She was found on the feet of Mr. McNair, who sat on the sofa," he said. "It's very hard for everybody involved," Li said. "Our thoughts and prayers go to the families." Earlier in the week, police said that on Thursday evening, Kazemi purchased the pistol found at the scene. Hours before the purchase, Kazemi was pulled over in a traffic stop and charged with driving under the influence. She was accompanied by McNair in a Cadillac Escalade he had purchased for her. McNair was allowed to leave the scene in a taxi after Kazemi was given a field sobriety test. On Friday night, Kazemi who worked as a waitress told a co-worker "that she was thinking about ending it," Serpas said. Police found their bodies in the condo -- leased to McNair and his friend Wayne Neeley -- about 1:30 p.m. Saturday. The two had been dead for hours before Neeley, who had to use a key to enter the building, discovered the clothed bodies Saturday afternoon, according to police. Neeley then called his friend Robert Gaddy, who arrived at the condo and called police. Serpas said it is unusual for such a time gap, but "not unheard of." He said police do not believe the crime scene was tampered. McNair spent 13 seasons in the NFL, mostly with the Tennessee Titans, where he excelled on the field as quarterback. He was named the NFL's co-MVP in 2003 and spent his last two seasons with the Baltimore Ravens before announcing his retirement in April 2008. The Titans reached the Super Bowl in 2000, losing to the St. Louis Rams. McNair led the Titans in a dramatic comeback that day, with a final tying touchdown coming up a yard short. "Any death is tragic," the Nashville police chief said, "and the deaths we're talking about today are tragic to the families of all involved and tragic to our community."